Ostomy accidents can happen – leaks, blowouts, strong odors; you name it, if its prone to causing embarrassing situations, it’s probably going to happen at some point. But with some help (and experience), you’ll soon know how to manage the potential disasters prone to any situation. Maintain a good outlook of things, learning to laugh through life’s hardships can ensure that you’ll live longer and happier. But all proverbial optimism aside, here are some straightforward tips and products that can help you to best prevent and manage accidents with an ostomy in your normal day-to-day life. Change to New Products – Stomas come in all shapes and sizes, so maybe the particular product you’re using isn’t the best for your individual stoma. For example, some stomas are retracted in the skin, so they’re more prone to leaking when attaching an appliance. A convex-shaped wafer/barrier adds extra protection for these types of stomas. There are also moldable seals, powders, adhesives, and wipes all designed to help leaks and manage stoma issues. Knowing the options available to you and discover what best suits your individual needs. It never hurts to ask a manufacturer for samples of specific products you think may help, or to ask nurses & physicians about the types of products available. 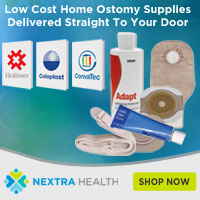 We have many posts on ostomy products on Ostomy Guide, here’s a buyer’s guide for ostomy supplies with illustrations and explanations on the basic features of ostomy products. Drain or Change Regularly – Take the opportunities you have to empty or change your pouches when available. As a good practice, empty a drainable pouch when it’s 1/3 full, but whether you’re 1/3 full or not it doesn’t matter; if you’re an active person, it is always best to drain when you have the chance to do so. Pack and Carry a Kit – A suggested kit would contain the wafer/barrier (ideally pre-cut if traveling since you can’t take scissors on a plane), replacement pouches, barrier wipes, an odor-killer spray, and airtight waste bags for discreet disposal. Keep it on you if you’re out and keep it nearby if you’re at home, work, school, etc. And, speaking of planes, here is some information on Traveling with an Ostomy. Patch it up – If you’re in a bind and your ostomy pouch is leaking, find out exactly where the leak is coming from and see if you can patch it or clog it with something. Most commonly, leaks form underneath the barrier because the adhesive comes loose. Strapping this down with a strong tape like duct tape (yes, it does fix everything! ), or stuffing a napkin in there can buy you enough extra time to get to a bathroom to minimize leaks and manage your ostomy. Proper Clothing – If you walk a lot, wear clothes that allow your stoma and appliances some breathing room. You’ll decrease friction of the clothing against the baseplate (which can cause edges to come loose), and decrease irritation of the baseplate against the skin. If you want extra protection for this, you may consider Ostomy Armor a unique product designed to protect a stoma and appliance. 1) Nutrition – Keep track of what you eat and how it affects your ostomy! Especially new ostomates who have not yet seen how their diet affects their ostomy. All foods are digested differently; this includes how your body passes it. See Ostomy Nutrition and Diet for some basic guidelines of eating and drinking with a stoma. 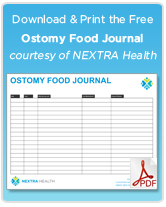 You can also track your diet with this free printable Ostomy food journal. 2) Drain before bed – A no-brainer really; drain or change the pouch before bed and again when you first wake up. 1) Carry a Spray – Something strong enough to neutralize airborne odors instantly. They’re sold in stores but there are strong, fast working options that are convenient enough to carry in a travel pack, like Medi-Aire Odor Eliminator and Odor Assassin. 2) Use a Pouch Deodorizer – Pouch deodorizers are either a drop formula that goes into the pouch to neutralize odors inside, or a vent and filter system that is either integrated or attached to the pouch to drain gas. One example is Filtrodor Filters from Coloplast. 3) Devrom Tablets – A simple tablet of bismuth subgallate taken with meals can help lessen pouch odors. Find Devrom here. Also, it’s a little redundant I know, but see the Ostomy Guide post on Ostomy Odors and Cleanliness. A pouch ‘blowout’ is the mother of all nightmare ostomy accidents, second only to not having the supplies to clean & re-pouch. Blowouts can happen for a number of reasons; faulty appliances, poor appliance changing, external pressures on a pouch, or the fasteners on a pouch coming loose can all be causes. Gas buildup in a pouch can fill it very quickly. With an ostomy appliance, the point of weakest resistance is always going to be the first place to pop open. This is usually going to be the barrier/pouch connection, or in the case of drainable pouches, the drain outlet at the bottom. There must be a way to release the gas from the pouch. Many pouches come with integrated gas filters, but if yours does not, you can install one like the Osto-EZ-Vent or a Filtrodor Odor Filters to release gas buildup. Hopefully these tips prove useful for you. Please comment any additional thoughts or comments. Thanks! Can you help me by suggesting a product I can use while the skin around my stoma heals? I have 2 pretty large cuts that may have been caused by some adhesives or bending/movement. One cut is about an inch from my stoma & the other is about 4-5 inches below the first cut. It’s been very difficult letting air to the cuts for healing. Right now I am having problems with my pouch. It frequently gets blocked when I am sitting in my usual position, and it tends to leak more than usual. I use Invacare products. There is nothing more frustrating (aside from a less-than-great love life, that is) than having your ostomy pouch leak frequently. I have a urostomy pouch, and ordinarily it goes a week without leaking, but occasionally I go through these phases where i leak every other day, or every three days, or sometimes more than once a day. I know that situations like this depend on the individual person, but nothing drives me up the wall more. I once came close to having an emotional breakdown over it. Hi. My dad just had the surgery May 12th. And my mom said that it looks like my dads stoma came loose. Is that bad/OK/horrible? And I could use answers fast. My mom just descovered this. As much as I’d love to be able to provide answers for you, your dad needs to talk with his doctor as soon as possible! I’m so sorry! I guess I didn’t say that very clear. It didn’t come completely off. Just in one spot. Thank you! By the way I’m eleven. Hello I have just had ostomy surgery on 02/12/2016. I have been having issues getting my ostomy bags to stick and stop leaking. I am using ConvaTec drainable pouches. In the last 24 hours I have leaked through 9 bags. I have used the stoma adhesive powder and the wipes to clean off the adhesive and the wipes to help the bag stick. I have 11 bags left and also have an appointment to see my doctor and care nurse on 02/29/2016. My stoma is inverted and is red and sore around the stoma. I would appreciate any input so I can get a bag to stay on until Monday and so I can get some rest. Thank you so much…. Hi I need some help .. There is burning where the tape is and it’s not leaking .. It happens the minute I change the whole thing and put a new one on any suggestions???? Please help !!! My SIL is new to her ileostomy. Dr put the stoma in the crease of her belly, to the right of her belly button. Stoma has inverted. Cannot get amy bag to stay sealed. She had been to the doctor several times, Home Health Nurses change and to ER multiple times since surgery, which was a month ago. The doctor said overweight people can have stomass invert. Not only is she having constant leaking where the seal becomes broken at least 1-3 times a day, the skin around the stoma is raw and bleeding. Her surgeon said there’s not much he can do that the ostomy nurses knows more about the bags than he does. They have used powder, glue, wafers, convex… Please help! I’m very sorry to hear about the issues that your SIL is having. Have you switched up the brands of products being used? Many ostomates find that that some pouching systems and skin care products work better for them than what is the usual recommended brand options by their doctors. I would suggest doing some research into alternative products and brands, then asking your health care practitioner if it could be a reasonable substitute for the products that aren’t working, and possibly you can find something that works better for you. I wish we had better advice, but unfortunately we’re not able (or qualified) to provide any specific medical advice to help your SIL’s situation. Does putting a pin prick in the pouch help with letting the gas escape to prevent blowouts ? My Ileostomy stoma is about an inch long however at the base it indents into my belly. I use rings to fill in the indentation but still have many times when the output leaks under the seal. Anytime know of a solution to this issue? also my stoma is really high, above my belly button. Waistbands all fit right on top of the stoma causing all kinds of issues. I can’t tuck the bag into my pants or underwear. Anyone else have this problem and how do you deal with it? My husband has a newer colostomy. He uses the Hollister 2 piece wafer / filtered pouch and Brava lubricating deodarent in the pouch. He has been having very serious odor issues. Even within 24 hours of changing the whole thing. The stool gets caked around the flange and is impossible to completely clean out. Please help. He really stinks he doesn’t get enough supplies to change it all out daily. Suggestions? My mother has lost 60 lbs but still has loose skin around her stoma and has been going a month where they change the bag 3-4 times a day.. Whats the best most adhesive bag? My sister’s husband has a stoma and has Alzheimer’s. Is there something that could help her? My sister’s husband who has Alzheimer’s keeps pulling his stoma loose. Any suggestions as to prevent this from happening? How do you get the smell out of your clothes when your bag leaks? My mother has a colostomy type device. She has had leaking DAILY and we can not seem to prevent it. Any advice? Any at all would be helpful. Do I need to take any special precautions with my ostomy if I were to get a cat? Some people say YES and some say NO. Please, does anyone know what REALLY works with gas build up in my ostomy bag.?? I hate that leaking and constant need to empty, mainly to relieve bag of gas swelling. And I hate the visible blowing up of bag which shows through your clothing ! I feel like a prisoner with this ostomy bag. Help with advice that really WORKS. Thank you. Also, I take Gas-X which doesn’t seem to help. And……it does not matter what type of food I eat. Swelling happens regardless. 6yrs. now. Marcia 16th September, 20017. My sister works as a manager in retail and twice while women were changing into clothes their bags exploded in the change room and the customers just left it there and didn’t say anything or offer to clean it up. How disgusting!! Here’s a trick I learned that works perfect. the ostomy patch/adhesive section is round. After applying it to your skin and warming it up with your hands or even a low temp hair dryer, apply 3 pieces of nylon (not paper) medical tape in the shape of a triangle that covers the bottom and left and right sides of the ostomy patch. The tape should meet in a point at the top of the ostomy patch, and have a level piece across the bottom of the ostomy patch. Just make sure the tape covers both skin and the ostomy patch. My mother-in-law has a ileostomy and a urostomy that are approximately 1 1/2 inches apart. We can not find a combination of bags that work for the two ostomies without leakage. Can anyone help? I have had my colostomy for about 7 months, and experienced continued leaking under the wafer. One problem is that the stoma only sticks out about 1/2″, and the opening is on the lower part of the stoma & points down (sometimes it is flush with the skin). We make sure the skin is dry after cleaning up the leakage, use the stoma powder for irritated skin, use a bit of skin barrier on top of the powder, a barrier ring, a convex wafer, and we use heat to try to seal the wafer to the skin. Sometimes I can go 2 days without changing my bag, but usually it is once a day. I am grateful that I no longer have the abdominal issues I had before getting the colostomy, but this is affecting my life – it is hard to go anywhere unless I put on a new bag. I have tried both Coloplast & Hollister bags, with a similar result. Does anyone have any other suggestions?